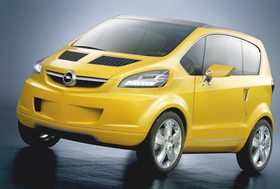 Opel unveiled the Trixx minicar concept at the 2004 Geneva auto show but the car never went into full-scale production. GENEVA – Opel/Vauxhall's planned new minicar will be a trendsetter in its segment, the brand's sales and marketing chief Alain Visser said. Visser said Opel plans a car below its Corsa to meet the growing demand in Europe for small, fashionable cars. "Internally, we call it an 'iPod on wheels.' That is what we are working on at the moment," Visser said in an interview at the Geneva auto show last week. "We want to do it within a short period, possibly within 24 months," he added. Last month. Opel CEO Nick Reilly said Opel has accelerated efforts to introduce a minicar below the Corsa. Reilly said at last week's in Geneva show that the automaker will invest 11 billion euros over the next five years "to refine our advanced vehicle technology and offer a fresh and exciting product portfolio." Reilly said 80 percent of Opel's model line-up will be less than three years old by 2014. This year, the carmaker plans eight launches including the Meriva, Corsa, Movano and Astra Sports Tourer. In 2011 there will be four new launches including the Ampera extended-range electric car. The minicar's launch in two years will be followed by an electric version one or two years later, according to Opel's plans.